All engine trend performance data is processed, evaluated and reported within 24 hours of receipt, every day of the year. Your online resource, webECHO, provides immediate reporting of your engine status and much more. Any significant changes to the trends are identified and advised/alerted to you directly, by email and telephone. Status Notification Reports are issued, if desired, every time you send data at trend release. Routine reports are issued monthly to give a simple and comprehensive record for your quality requirements and to maintain good communication with your key personnel. Finally, your feedback and data can be sent to us via webECHO or by email to complete the process loop. Our team of power plant engineers are available 24/7 to provide immediate support through fault diagnosis and technical issues and are available to provide guidance to your maintenance team and support facilities. 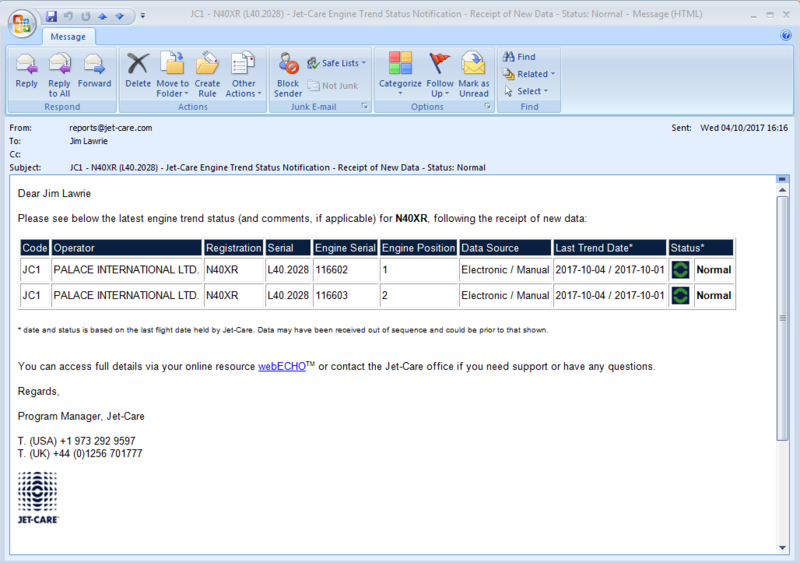 If desired, Jet-Care will also send a short and simple text report by email every time data is received. Routine reports are delivered once per month as a full summary report (pdf) by email to the registered primary and secondary contacts. Alert and Advisory reports will be sent by email at anytime the trend status is raised to a warning level. All Alerts will also be made by phone call. You can also create your own aircraft and fleet reports and other outputs from webECHO™ at anytime if required. webECHO is a versatile online resource available 24/7/365 and is the primary reporting tool to access your latest GA reports as well as manage your fleet data, view the latest engine trends and download data history.